Leaky Showers! What are the Causes and Options? When it comes to home renovations, the bathroom is often one of the most popular, but also one of the costliest rooms to be done. 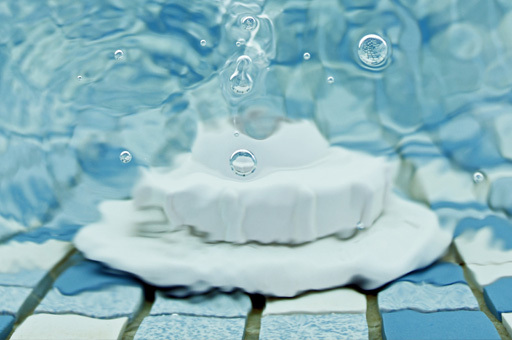 Apart from aesthetics, a Leaking shower is commonly the catalyst for a bathroom renovation. However, before you start ripping your bathroom apart, finding the cause of your leaky shower can be a more economical option and in most cases, you don’t actually have to spend all the money on a costly renovation! Taps/Shower Heads – this is usually the first thing people look out for. Sometimes when taps are installed they haven’t been sealed properly and therefore water can be leaking slowly; appearing through the walls, door frames or floors. Pipes behind the wall – there may be a leak in the pipes behind the wall, and if it’s between the valve to the wall joint, you might be able to tell from a pressure test. It could also be any of the pipes connecting to the shower. Shower Screens and Recess – when showering, water runs down the screen to the frame and if the silicone seal has worn off over time, water can travel and come out through the tiles and in the corners. Sometimes, a shower screen is installed on the outside edge of the recess and water can escape behind the tiles on top of the hob and soak through the floor. Tiles and Grout – after years of daily use, grout wears off and as tiles are porous, water travels out of the shower causing a leaky cubicle. Shower Base (Waterproof Membrane) – older homes may have a galvanised tray which rusts over time, or the membrane may have failed due to improper installation. Sometimes, foundational movement or floor and wall frame shrinkages can also cause issues with the waterproofing. As you can see, there can be various reasons for a leaky shower. 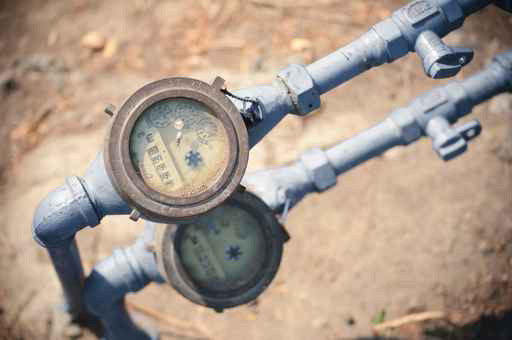 It is usually very difficult to determine the cause without the help of a professional leak detection specialist. This is where Leakspotters can help. Our modern Sonar Leak Detectors will locate leaks behind the walls and our experienced technicians can repair or replace taps and shower heads. If there appears to be an issue with the shower base, our methods such as Dye Testing can determine the cause. And, provided the structure of the shower recess is sound, an inexpensive repair can be offered in most cases. This approach ls less costly and less intrusive to your daily routine, with the repair taking about half the time. 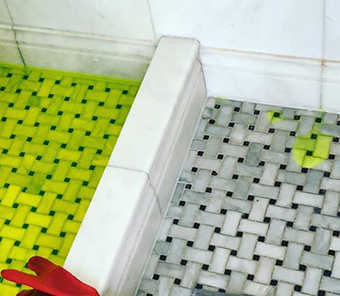 Dye testing showing where waterproofing has failed allowing water to travel below tiles. Problem: A shower was leaking water out of the cubicle and wetting the skirting and wall in the bedroom wardrobe next door. Solution: The Leakspotters technician used his high-tech sonar equipment and quickly discovered that the water was not coming from a leaking pipe or tap. In fact, the shower water was escaping through the base tiles due to a waterproofing problem. This needed an over the tiles waterproof, in which a waterproof sealant was applied over the tiles of a thoroughly prepared cubicle by our technician. The shower cubicle has since been leak-free, mould resistant and looks like new again! To find out more about Leakspotters’ services and how we can help you, click here to visit our website or call us on 1300 362 858 today!